Comments: The third and last show at Bodokan Hall in Tokyo on this tour, with Adam Lambert on lead vocal. Roots: Audience recording, claimed to be from the master recording. 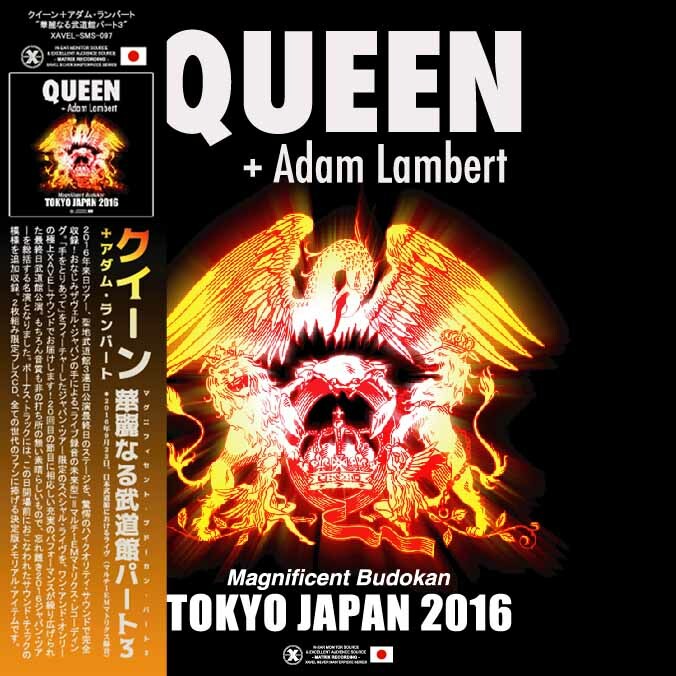 Queen + Adam Lambert 2016 Japan tour, Tokyo 3 day in the stunning high quality sound complete recording stage performances last. Exquisite balance stereo mix and high-quality audience source label original with IEM source groups mix and balance of each on the stage with each Member. 2016 familiar XAVEL label by future-live recording-multimedia IEM matrix and recording is the latest version. XAVEL label has released a IEM matrix sound similar in Samson's first visit to Japan performance as Queen + Adam Lambert in 2014, but the sound quality of this title and reach in another dimension completely, and of the evolution of the two-year will show clearly. Can feel the ideal live sound combines the powerful "clearness" and source the best audience appeal as the "crispness" of specific sound board sound and realistic sense of satisfaction in May. Live in the "holy land" Japan Budokan 31 Buri to be 3 of either special live performances every day, "in my hands", featuring Japan tours limited was memorable for many fans. The perfect stage proceedings was to round out this day performances in set terms is no big surprise, intrigue and pride, with a perfect lock Shaw (has decided bashitsu and "born to love you" guitar solo too! I'm live at the Budokan "sacred ground", this day becomes the 20th anniversary, sound quality without a doubt this day will best balance (this XAVEL IEM matrix 3 performances are wonderful workmanship, so really won is), so, by all means want you pressed. Add recorded sound check bonus track, performed in front of this open pattern. Press 2 CD, Japan-language band with specifications limited production Memorial items. (9/21), the first day of the simultaneous release eyes please look forward to the definitive video (9/22), and the subsequent appointment.